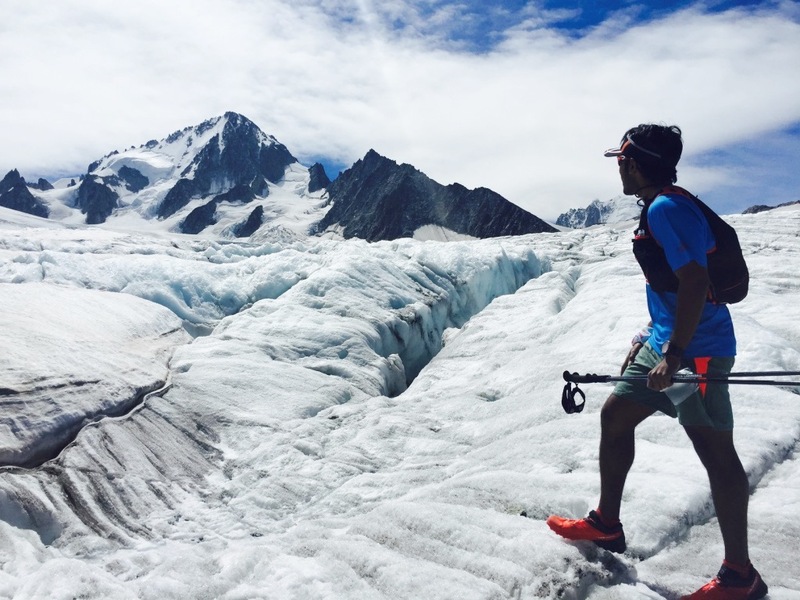 We speak to Ashok Daniel, the youngest Indian to complete the Ultra-Trail du Mont Blanc (UTMB). In a relatively short span of time, he has been to a variety of races, the bulk of them partial to trails and mountains. Six-pack is the flag bearer of the gym movement. For some gym goers, despite six-pack, gym becomes limited fascination. The type of person you are, matters. There is only so much the confines of a room and its occupants sweating their way to sculpted glory, offer for engagement. “ I got my six pack and all. But I was finding gym work-out very repetitive. It became the same thing over and over again, it became boring,’’ Ashok Daniel said. Born December 1990, he grew up in Chennai’s Besant Nagar, a suburb that got its name from the noted theosophist, Annie Besant. It is a well-known suburb, particularly popular for its beach – Elliot’s Beach, also called `Bessie.’ The Theosophical Society has its headquarters in neighboring Adyar. Its premises or `garden,’ spanning over 250 acres, is one of the greenest parts of Chennai. Ashok’s father worked as a lawyer; his mother, a teacher. As a child he was on the heavier side and had no interest in sports. By the time he was in twelfth standard, he weighed 93 kilos. When he reached law school Ashok decided to address his obesity. He joined a gym and through a combination of work-out and diet, brought his weight down to 58 kilos in six months. “ I was very dedicated when it came to working out at the gym,’’ he said. That was why the emergent boredom bothered. If you have known a regimen and its benefit long enough, threats to continuing it, worry. And yet, there was no denying the truth – gym sucked because there is no creativity in repeating and repeating the same thing. In direct proportion to six-pack sprouting on abs, the mind felt bored. On the other hand, if you left the gym’s confines, you became one with the world. If you moved around in that world, the world and its many dimensions engaged you. The brain likes variety. “ I used to jog in the morning and hit the gym in the evening. Between the two, I decided to pick running and focus more on it,’’ Ashok said. As it turned out, all those months of morning jogs and strength training at the gym, had laid the foundation for a potential runner in him. A Sunday, he saw senior citizens running a half marathon in Besant Nagar. It prompted him to sign up for his first running event – the half marathon segment of the Chennai Trail Marathon organized by Chennai Trekking Club (CTC). He finished fourth in that. Ashok’s progression over distance categories appears to have been rapid. Following that half marathon, he signed up for the Chennai Marathon and the Bangalore Ultra. At the latter, he planned on attempting the 25 km-category but when almost everyone he connected with online in discussions around the event seemed to be headed for the 50km, he changed his mind and registered for that. At the Bangalore Ultra, his fist 25km-loop went by smoothly. The next was painful. He finished the assigned 50km in around six and a half hours. The good thing about an event is that you meet like-minded others. He trained through November 2012 with runners he met at the Bangalore Ultra; in this case – a group from Chennai YMCA. He ran the Chennai Marathon in around four hours. Following this he kept attending races in other places – Hyderabad, Bengaluru and Auroville among them. Around this time, he read a book titled Extreme Running. Published in 2007, it was written by Kim McConnell and Dave Horsley. According to information on the Internet, the book provides an overview of extreme running and races in that niche located in testing environments like mountains, cold places and hot deserts. The book played a big role in effecting Ashok’s transformation from a runner of half marathons and marathons, to runner of ultramarathons. But while it offered a goal, finding the path to it seemed Ashok’s onus. In the lean season following the run at Auroville, he began ramping up mileage, sometimes up to 160km per week with 50km every weekend. “ The distance barrier broke for me,’’ he said. This phase was followed by a project in league with his friend Sreekumar – run a half marathon every day for 50 days with weekend runs going up to 30km. Sreekumar did this for 80 days, Ashok said. “ The first 20 days of this was painful. Thereafter the body got used to it. We even upped the weekend distance to 50km. All this running was done early morning; start running by 3-4 AM and be done by 9 AM. None of us had any clue on how to handle training for ultramarathons. We decided to figure things out as we went along,’’ he said. Also happening around this time was a run from Chennai to Puducherry. There were five runners. On the first day, two of them including Ashok ran 75km. The next day, the same two did much of the running and reached Puducherry. In English folklore Robin Hood is an outlaw with a difference. Operating from Sherwood Forest in Nottinghamshire, he robs the rich to help the poor. His main adversary is the Sheriff of Nottingham. The story of Robin Hood contributed to making Nottingham a known name worldwide. In 2013, Ashok moved to the UK to do his masters in law (LLM) at the University of Nottingham. He joined the university’s running group. That group – they were into cross country running – was composed of fast runners. “ I had to raise my performance. The university group was my introduction to structured training. My time in the UK taught me to train smart, not merely hard,’’ Ashok said. In Nottingham, he ran less and trained more. The idea of piling mileage got recast. He was exposed to the concept of acquiring muscle memory. Nutrition was emphasized. He also got introduced to running on trails, in mud, in the rain. “ Trail running was something I wanted to do. I had got bored of road running,’’ Ashok said. He did a 50 mile-race in Sheffield. It was a low key event; a mud fest. He ran it in road shoes. But he managed a decent time – around nine hours. Soon he was dreaming of UTMB – The Ultra-Trail du Mont Blanc – among the most coveted ultramarathons out there. It is 166km long with roughly 9600m of cumulative elevation gain. To run UTMB, you have to accumulate points running other races accredited for the purpose. UTMB was first held in 2003. The entire UTMB basket consists of the main UTMB, the CCC (Courmayeur-Champex-Chamonix) entailing 101km of running plus 6100m of elevation gain, TDS (Sur les Traces des Ducs de Savoie) at 119km plus 7250m, OCC (Orsieres-Champex-Chamonix) at 53km and 3300m and PTL (La Petite Trotte `a Leon) at 300km plus 28,000m. According to Wikipedia, the route basically follows the Tour de Mont Blanc hiking path, a loop around Mont Blanc, passing through France, Italy and Switzerland. However, changes in route do happen from year to year, main reason being safety. 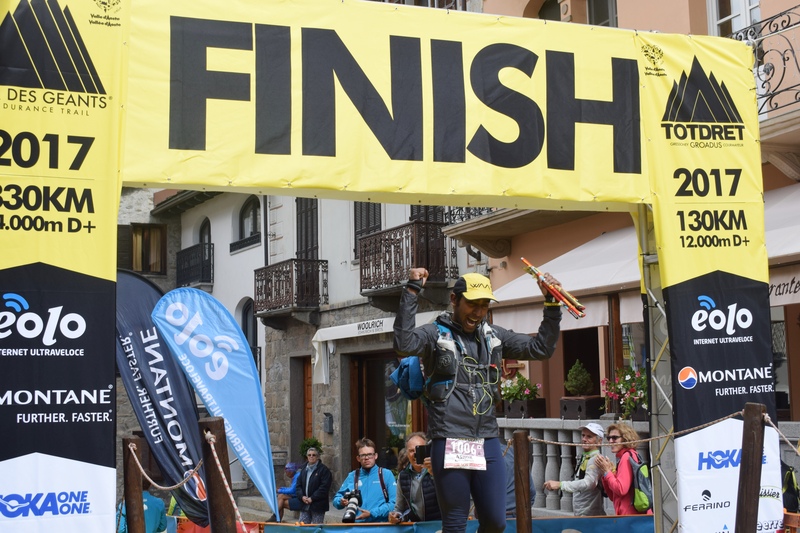 Ashok’s blog post on UTMB put the challenge in perspective: Generally people take around a week to ten days to get the route done at a leisurely pace but during the race we have around 46 and half hours to finish it. Given the need to accumulate points for eligibility to apply, UTMB smacks of project. For aspirants, it is a long haul. 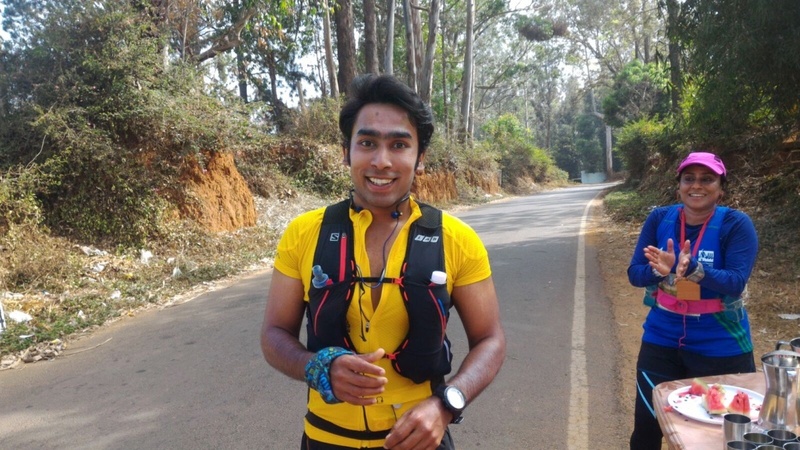 In 2013, when he came to India for the holidays, Ashok ran the Nilgiris 100, completing it in 14 hours. It was a race that provided UTMB points; he gathered some in the process. In December that year, having accumulated UTMB points from the races in Sheffield and Nilgiris, Ashok applied for the 2014 TDS, part of UTMB. For Ashok, 2014 was the first year with a real calendar in running. In March 2014 he ran the Oldham Way 40 miler. In April he did South Downs Way, a 50 miler along the coast. South Downs Way is basically a long distance footpath and bridleway along the South Downs in southern England; it is one of 15 national trails in England and Wales. Wikipedia says people have been using the paths and tracks linked to form South Downs Way for approximately 8000 years. 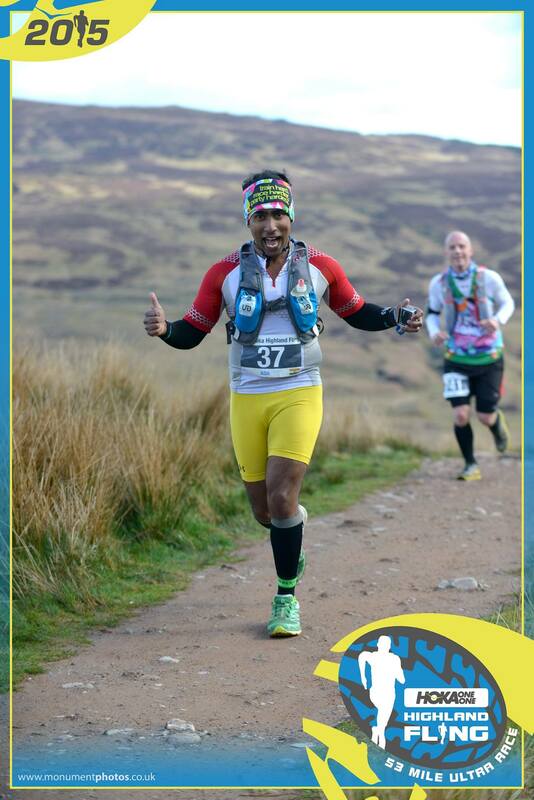 A week after the 50 miler at South Downs Way, Ashok did Highland Fling, a 53 miler from Glasgow to Tyndrum. Lack of recovery from the previous run hit home and he was forced to abort the run at the 30 mile-mark. Next he signed up for the West Highland Way Race; it had UTMB points on offer. West Highland Way, a long distance trail in Scotland, was opened in October 1980. The first race on it – it was between two athletes; one well known, the other little known – happened in June 1985. From next year onward, it was opened up to more runners. At around 24 years of age, Ashok was the youngest runner in the 2014 edition of the 95 mile-race. Waiting at the 50 mile-mark were his uncle and aunt. On race day, Ashok reached 50 miles to be greeted by stunning scenery. He felt good. He cruised for the next 20miles. That was a revelation for him – realizing that such energy kicks in so deep into a run. At 75 miles, by when he had been running for over 20 hours, things started to go wrong. He had his first spell of distance running’s hallucination. Then he started to feel “ super sleepy.’’ But a Scottish friend who was along – Gavin Bussey – egged him on. Gavin dropped off at the 80 mile-mark. At that point, Ashok was pulled out of the race and told to wait for the others. Cut-off time was 36 hours and there was much time left. However, his muscles began to seize. The next section of the race was isolated and risky. The organizers were reluctant to let Ashok continue. “ I was a hallucinating mess,’’ he said. Two runners who came in just then, agreed to take him along. “ Those 13 miles were the hardest of my life. 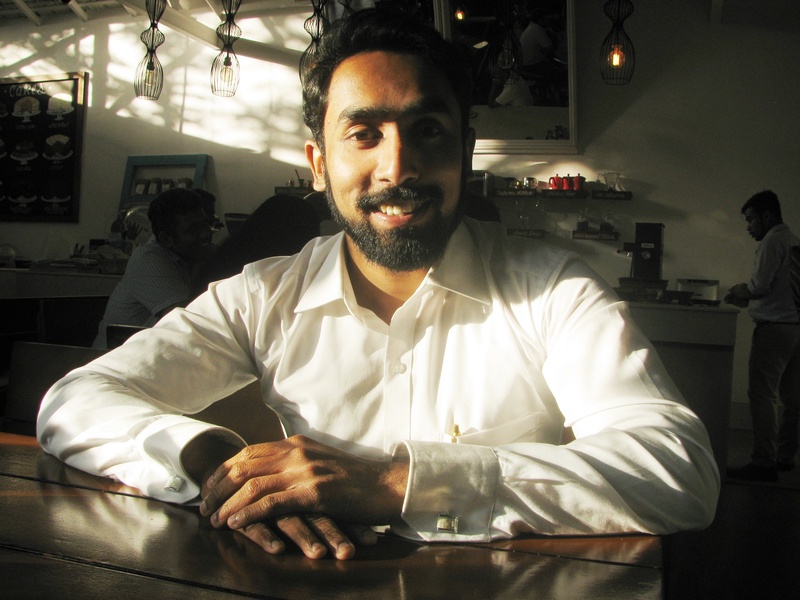 My body was literally shutting down,’’ Ashok said. Fresh life kicked in over the last 10 miles. The scenery was lovely; Ben Nevis – Britain’s highest peak – was visible. Eventually Ashok completed the race in 32 hours. West Highland Way has remained special for him as an instance of the running community making sure that he got to the finish line. The rest of that summer he licked his wounds, slowly recovering and regaining his strength. He commenced running only two weeks before TDS. That was too late to attempt the race properly. So he let TDS go by that year. But he travelled to France to see UTMB and came back resolved to run it. A point worth noting is that each of these visits to UTMB and its locale was enhancing Ashok’s familiarity with the race and its dynamics. Ashok’s blog mentions him having a degree of familiarity with the event by the time he got down to actually running it. Lake District is a mountainous region in North West England, famous for its lakes, forests and mountains. In October 2014, Ashok did a 50 miler in the Lake District and although it was far from satisfactory, it gave him precious UTMB points. Adding that to his existing bank of points, he applied for the 2015 UTMB. Then once again, setback occurred. In an accident, he tore an abductor muscle. It forced him to skip plans of running once again at Nilgiris 100 and put him out of action till mid-February 2015. Returning to training, he decided to give a shot at a race he had signed up for in November 2014 – Transgrancanaria (125km, 8500m elevation gain). Held since October 2003, the race sees participants crossing the island of Gran Canaria in the Canary Islands, on foot. Yet again Ashok made the mistake of deeming himself fit too early and ended up doing a DNF (Did Not Finish) at around 65km. At this race, he met for a second time, Paul Giblin, a Scottish runner who had won the 2014 West Highland Way. Paul started to coach Ashok; get him ready for UTMB. In March 2015, Ashok ran Oldham Way again. In April he repeated Highland Fling too. In May he headed for Transvulcania. 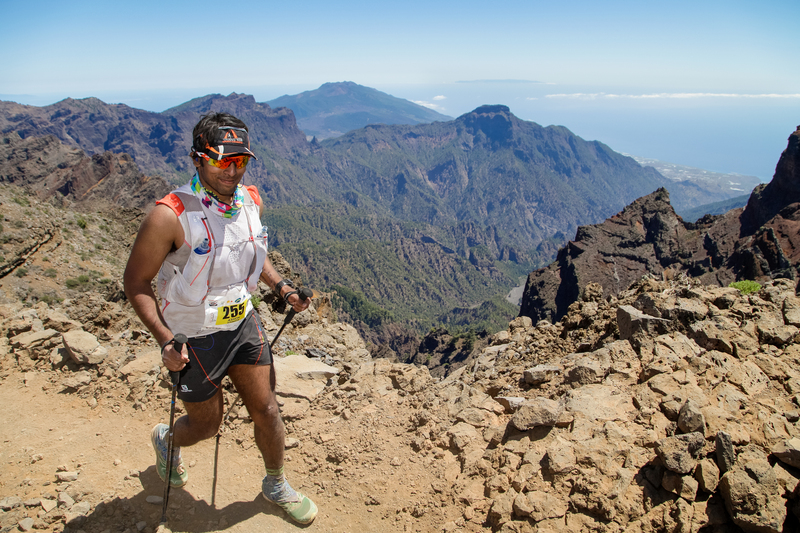 This race, another one held on Canary Islands, is rated among the toughest ultramarathons. It has been held since 2009 on the island of La Palma. Ashok found the race living up to its reputation – it was tough. The weather was warm and the route, steep. His blog post on the race put La Palma and the weather in perspective: The place is stunningly beautiful and less touristy / trashy than other Canary Islands as it’s harder to get to but there’s a reason it’s called the Isla Bonita (Beautiful Island). It has some of the most varied and technical trails in the world and gives you a real sense of skyrunning as you are literally running above the clouds for most of the race. It is also the most mountainous island in the world. Although technically its part of Spain, it’s just off the coast of Morocco in Africa and often around the time of the race we get hot winds along with Saharan smog to the island, which certainly spices things up; this natural phenomenon is called `Calima.’ “ The first 50km of the race was awful, I almost had a heat stroke’’ he said. He started to cramp and throw up. Eventually, he finished the race in 16 hours and 45 minutes with 15 minutes left for cut-off. Transvulcania took a toll on Ashok. 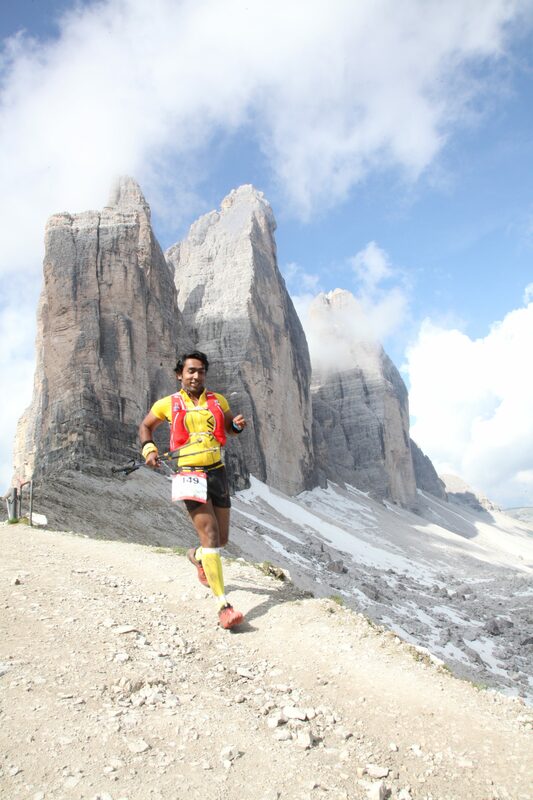 But that didn’t stop him from signing up for the June 2015 Lavaredo Ultra Trail in the Italian Dolomites. Although he trained well for it, within 20 minutes of starting the race, he grew nauseous. He had to stop running by 50km. Paul and Ashok didn’t want to mess up prospects for UTMB. They decided to come back for the race in the Italian Dolomites, next year. Site of the first winter Olympics in 1924, Chamonix lay in south eastern France. It is close to the peaks of the Aiguilles Rouges. According to Wikipedia, the north side of the summit of Western Europe’s highest peak – Mont Blanc – and therefore the summit itself is part of the village of Chamonix. The place is a magnet for outdoor enthusiasts. Chamonix is much revered in climbing. It is also UTMB country. 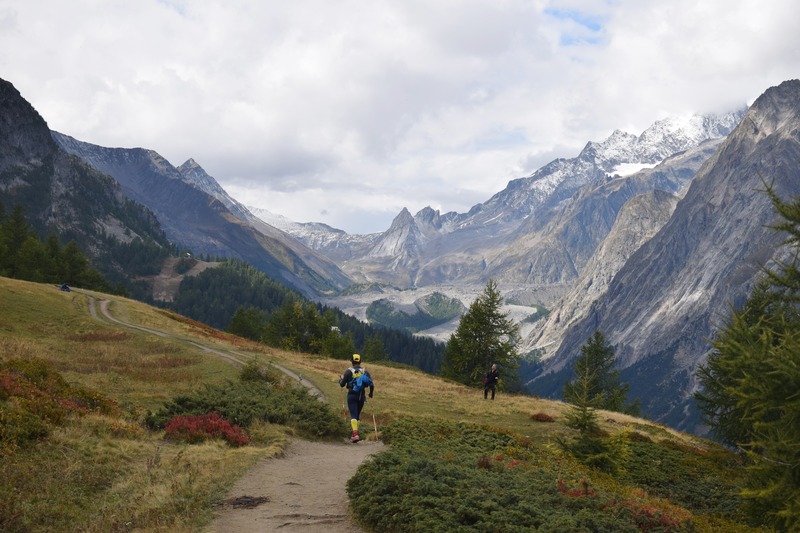 Paul was training for UTMB around Chamonix. It being holiday season, he asked Ashok to go along. Ashok ran the UTMB route over 2-3 days. He was in good form; he also felt mentally ready for the race. 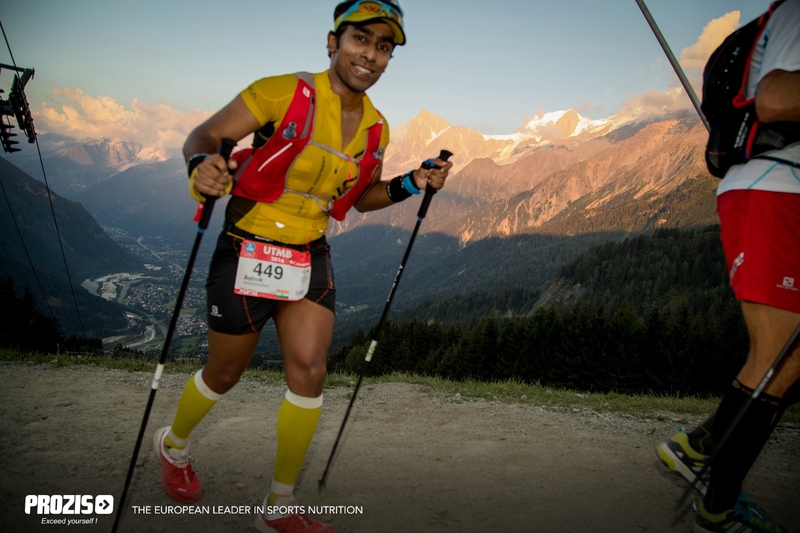 Reaching France that year to do the CCC was India based-ultra runner Kieren D’ Souza. Ashok had been in touch with him. According to Kieren, they were both participants at the 2013 Nilgiris 100. However an opportunity to meet and talk hadn’t manifested at that race. In 2014, when Kieren got around to applying for CCC, Kavitha Kanaparthi who manages Globeracers (they organize Nilgiris 100) mentioned about Ashok, a runner based in UK with plans for attempting UTMB. That’s how the two connected. Subsequently they met up in Chamonix, two to three days before commencement of the 2015 UTMB. Kieren went on to complete CCC. For Ashok, the race went well up to the 60 km-mark. Past that he suspected he was pushing himself but running empty. He wasn’t fueling properly. Around 65km, he took a fall and injured his hip. As a result, stretches with descent became difficult to handle. He had to DNF at 50 miles (he was pulled off by race medics). “ I was devastated. I was in good shape and had wanted to do UTMB for long,’’ Ashok said. He also suspected another angle; one that was philosophic. “ When you put on the UTMB bib you are supposed to respect the mountain. I think I got too competitive with the landscape. I shut everything out in the interest of performance, leaving nothing open for the ecosystem to seep in and inspire me. That came back to bite,’’ Ashok said. Three to four weeks after UTMB, he signed up for a 100 mile-race in UK called Autumn 100. He ran it to get UTMB points. The race is unique for its long night-running segment. A flat, fast course, Ashok completed the race in 23:30. All the disappointment accumulated from the aborted run at UTMB was flushed out. He decided to attempt UTMB again. In December 2015, his studies completed, Ashok moved back to India. He decided to take a six month-holiday. At the beginning of 2016, he applied for UTMB and was accepted. In February, he ran the Hong Kong 170 (it no more exists). For the first 18 hours of that race, it rained. Almost half the field pulled out. Having run in UK and the Alps, Ashok was alright with the bleak, wet weather. Around 8 AM, morning of the second day, he succumbed to sleep but snapped right out of it and somehow managed to finish the race. He completed it in 37 hours. Within two weeks of the race in Hong Kong, he participated in a 50km race in the Kolli Hills, a small range in Tamil Nadu’s Namakkal district. He finished it in five hours flat. Next he signed up for Lavaredo, the race in the Italian Dolomites. He spent May training in the UK. In June, Ashok ran Lavaredo. Paul told him to pace himself and enjoy the race. He completed it in 28 hours with two hours left for cut-off. “ That gave me a lot of confidence. I told Paul that I have got the monkey off my back,’’ Ashok said. Back in Chennai, he trained diligently, spending his weekends with Peter Van Geit of CTC, running long distances in the hills. He approached his second UTMB with all learnings from the past, in place. He also felt more relaxed. Yet again, in a repeat of the previous attempt, he hallucinated during one of the descents in the latter half of the race. He blacked out and woke up wondering where he was. Ashok describes it in his blog: On the way down I told Paige to keep running while I sat down to remove dirt from my shoes. 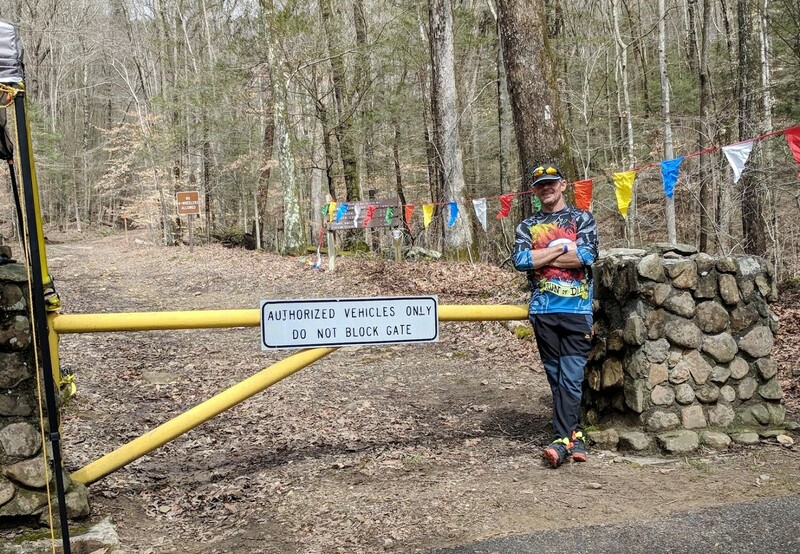 I had a blackout here for about ten minutes where I had a vivid dream which involved me volunteering two years ago atop this same mountain while tracking the elite runners. It felt so real that it was hard for me to snap out of it as my mind was playing the memories that happened two years ago before I snapped out of it and started questioning if THIS was real or I was dreaming. I slowly got back to my senses as people passed me. I looked at my bib and realized I am in the race and not volunteering! Slowly I got up and started running. Race cut-off time was 46 and half hours. Ashok finished it in 45 hours and 45 minutes. “ I really enjoyed the whole experience,’’ he said of the 2016 UTMB. In October 2016 he ran Malnad Ultra in Karnataka followed by a 100km-race in Thailand in February 2017. 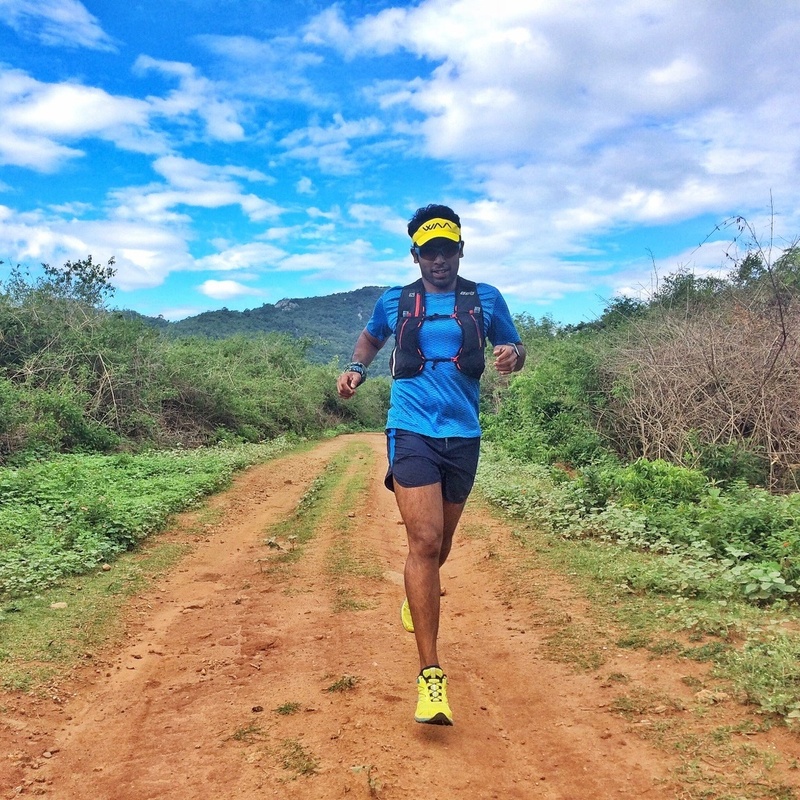 “ I didn’t finish the race in Thailand as I got lost in the forest,’’ Ashok said. That month, he also signed up for the iconic Tor Des Geants in the Italian Alps. The race located in Aosta Valley in Italy’s northwest, comes with a waiting list and lottery for admission. Each country has a quota. Nobody had applied from India. So Ashok got in without a problem. Ahead of the Tor, he also did a 100 mile-race in the US – Old Dominion in Woodstock, Virginia. It was on trails. Unlike trails in Europe, which are quite technical, American trails appeared well maintained. One reason for this, Ashok said, could be that many American races go back to horse racing and continue to be run on trails of that sort. Ashok completed Old Dominion in 23:45. The 330km-Tor Des Geants is a seven day nonstop race with cut-off set at 150 hours. The route includes some 25 mountain passes and cumulative elevation gain of approximately 24,000m. Positioned in the transition phase from summer to autumn, you get to experience seasonal change. Plus, it is one of those races, where you have to carry crampons for tackling snow and ice. Not all who participate complete the Tor. According to Wikipedia, completion rate is 60 per cent. In a piece he composed for his blog, Ashok notes that he had initially thought of the Tor as something he would attempt in his older years; perhaps an assignment amid midlife crisis. But then aged 26, he felt ready for it. His friends encouraged him to enroll; as first applicant from India, the race welcomed him immediately with no recourse to lottery. Ashok appears to have prepared well for the Tor. At a wedding in the US, he met Dima Finhaus, who had been a three time-finisher at the Tor. It fetched him valuable advice. Training for the Tor was done mostly in the hills of South India coupled with a month of running in the US East Coast (including Old Dominion) and time spent with Kieren running in the Himalaya. Still, despite preparation, the Tor was a handful. “ I went through a lifetime of emotions in those seven days,’’ Ashok said. His biggest challenge was sleep – most days he was sleeping only 20 minutes or so. Towards the end spurts of sleep evolved. “ I must have lost about eight kilos during the race. But somehow I had it mentally locked down,’’ he said. 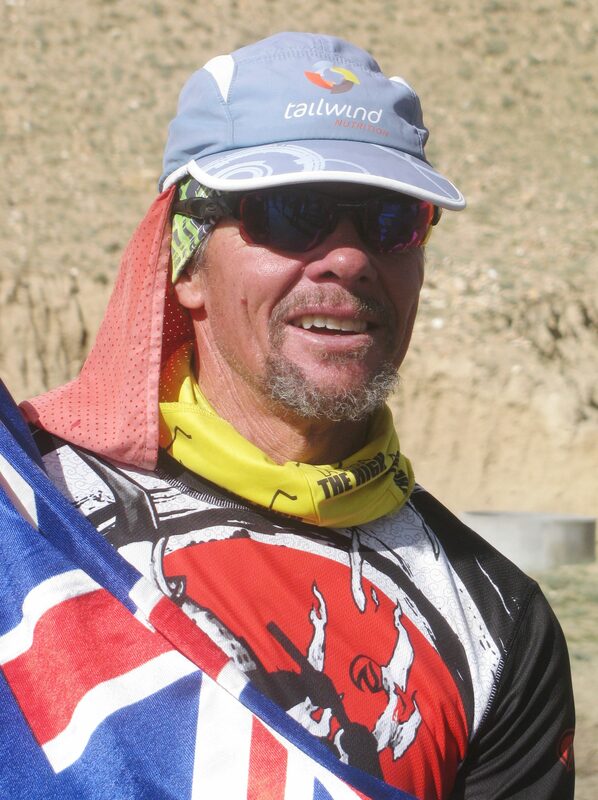 He completed the race in 147 hours and 41 minutes. Ashok has applied for the Tor again in 2018. Meeting him there would be Kieren, who is attempting a shorter version of the race. After the 2017 Tor, Ashok signed up for Diagonale Des Fous (also called Grand Raid) on Reunion Island, a French overseas territory located between Madagascar and Mauritius in the Indian Ocean. He was the first Indian attempting it. The event of October 2017 was the twenty fifth edition of Diagonale Des Fous. Cut-off for the 162km-race with 9643m of cumulative elevation gain, was 64 hours. 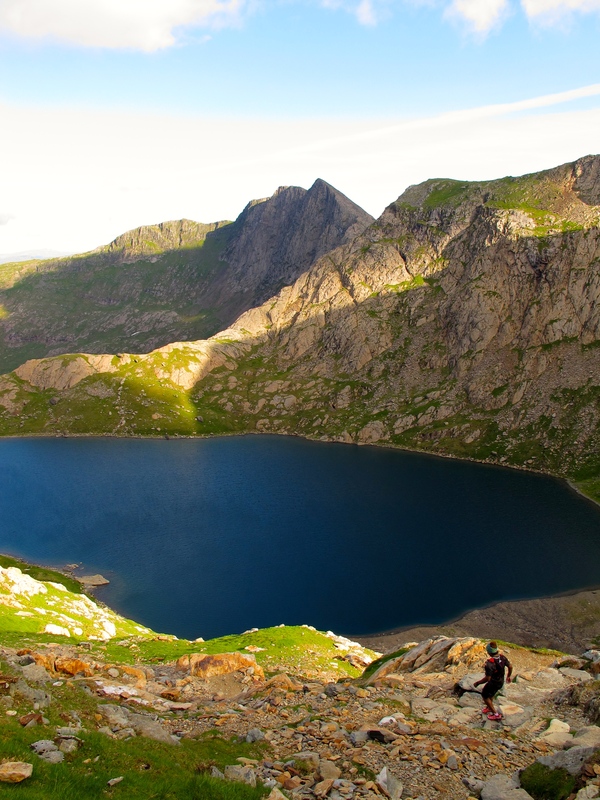 It was a technical route but given the location was a heritage site use of trekking poles was banned. “ I really suffered in this race. But it was a beautiful experience. I hate running on tarmac. I like being in the mountains. Flat is monotonous. It gets tedious. When you run in the mountains, you cannot shut off your brain. There is no fooling yourself. 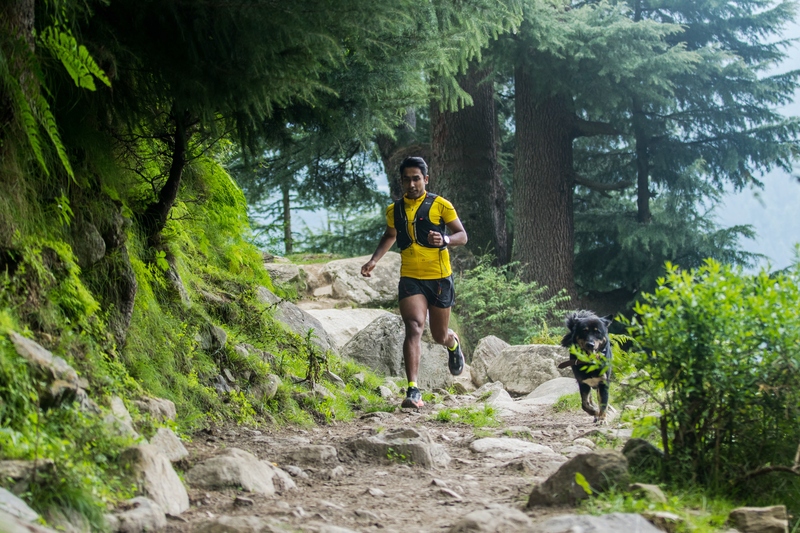 You can’t be on autopilot when you are running in the mountains,’’ Ashok said. According to him, years ago, when he started shifting more and more towards trail, it took him two to three months to get used to the transition and run without pain. Road forces the legs primarily into forward motion; trail requires sideways motion too – so there is both transition and getting used to, in the frame. There is also another transition happening across Indian athletes like Ashok and Kieren. 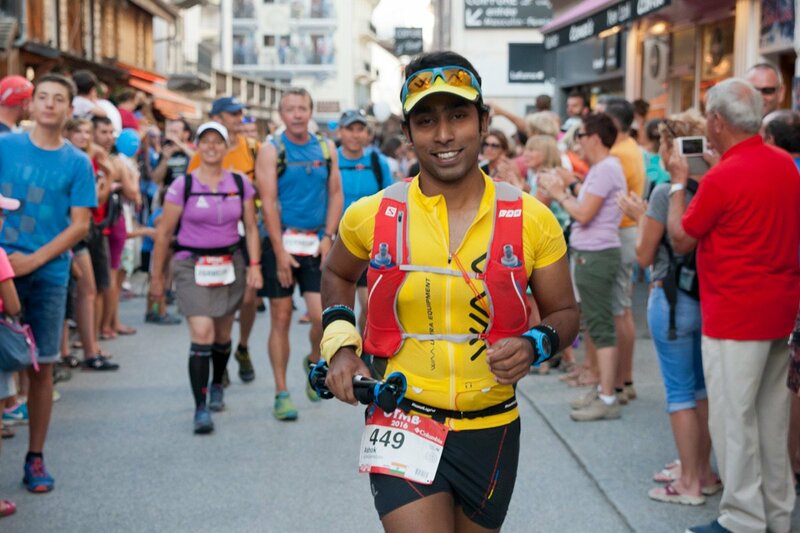 You can’t do a race like Tor Des Geants if you don’t really enjoy running in the mountains simply for what it is; but it takes years if not decades for this mindset to develop and having that deep ultra-running experience is vital: Ashok wrote. Read that alongside Ashok’s race statistics from the Tor – the advertised distance is 330km with 24,000m elevation gain but the post-race GPS log showed close to 350km and 31,000m. This, Ashok says, is like climbing three Everests while running a 200 mile-race with very little sleep. Although in their pursuit of the world’s great races athletes like Ashok and Kieren still tackle tarmac, their repertoire includes transition from road running to trail running and within that, willingness to tackle technical trails. Importantly – there is a lot of mountain in the frame. At this juncture, they become a convergence of skillsets from multiple disciplines – there is running, hiking, tolerance of altitude, capacity to move fast on rock and snow. 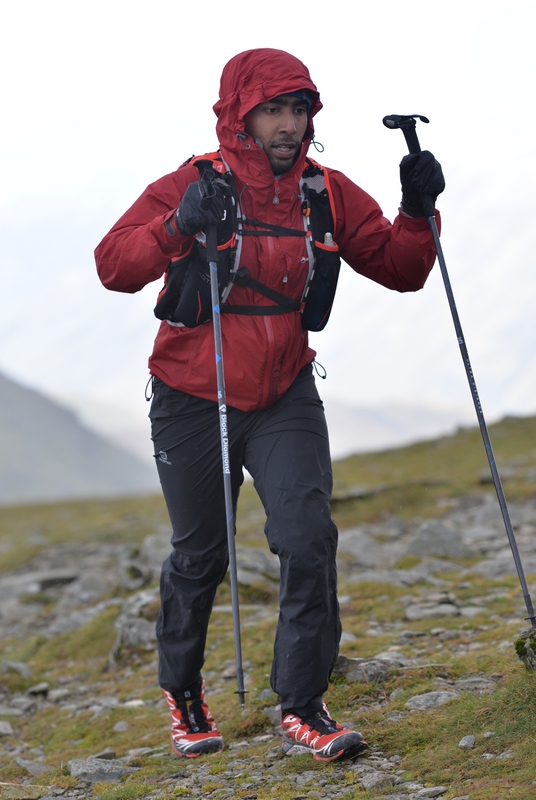 If you scan the world of endurance sports, the emergent term for this sportsperson of multiple skills is `mountain athlete.’ As with the Tor, Ashok has signed up again for the Diagonale too. The last race Ashok had done before we met in Chennai, early March 2018, was the 120km Ultra Trail Angkor Wat in Cambodia. A lawyer handling civil cases, he funded most of his running by himself. In the last three years, he said, he has been getting some support. A French company, WAA Ultra, supports him in sports attire; Unived in nutrition, Salomon India in shoes and Sunto in watches. T. Gopi is among India’s leading marathon runners. 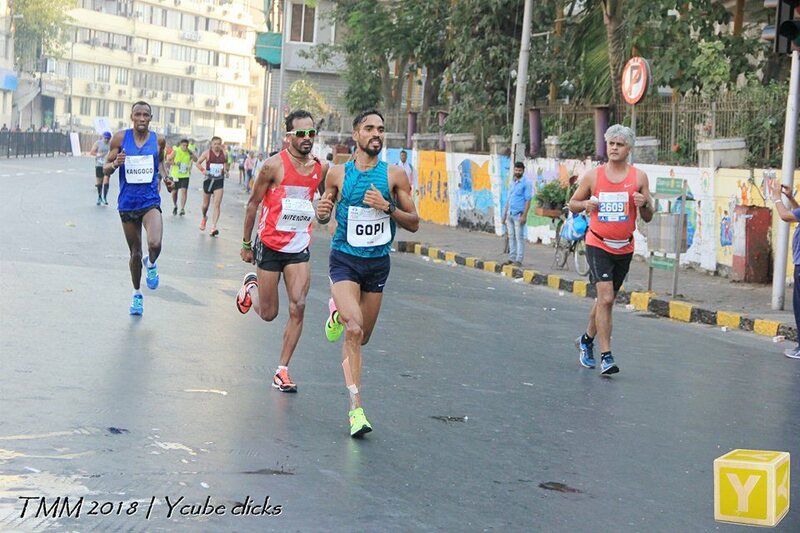 Assigned to pace the army’s best hopes in the discipline at the 2016 Mumbai Marathon, Gopi found himself not only running his first full marathon but also securing a podium finish. Qualifying thus for the 2016 Summer Olympics, he went on to finish a creditable twenty fifth in the marathon at Rio de Janeiro, covering the distance in 2:15:25. 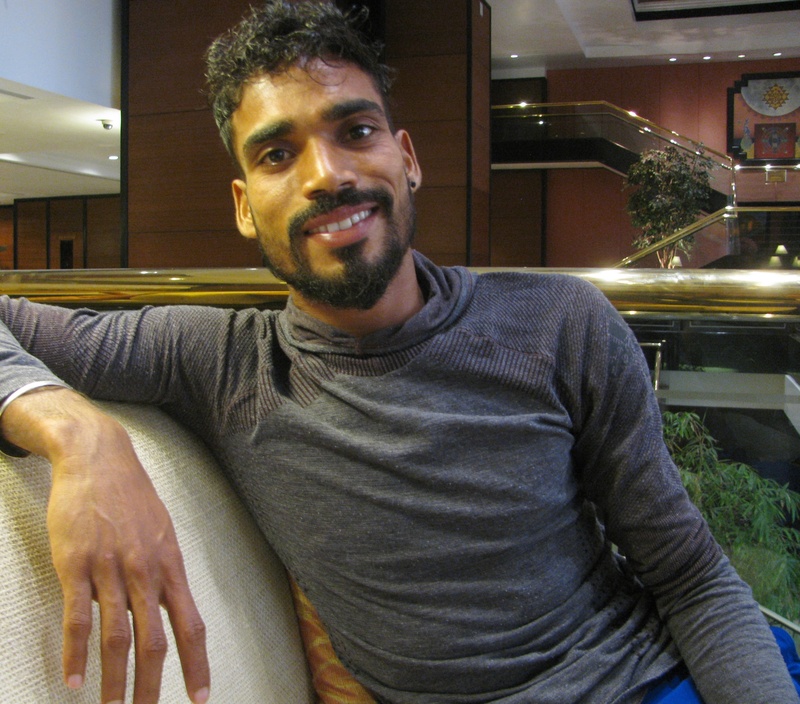 In August 2017 at the IAAF World Championships, Gopi placed twenty eighth in the marathon with a timing of 2:17:13. In November that year, he became the first Indian to clinch gold at the Asian Marathon Championships covering the 42km-distance in 2:15:48. In February 2018, Gopi improved his timing further from the figures returned at Rio; he completed the IDBI Federal Life Insurance New Delhi Marathon in 2:15:16. Media reports said that Gopi had commenced the run at a pace suited for 2:13, slowed down at the halfway mark and picked up pace again in the last ten kilometers but was unable to recover lost ground. The 2016 SCMM was where you made your mark as a marathon runner. Can you explain how that happened? I had this feeling that I may be able to qualify for Rio when the qualifying time was disclosed as 2:19. But that was one to one and a half months before the 2016 SCMM. I asked my coach if I may attempt the marathon. He didn’t discourage me. But he pointed out that there was little time to prepare and be good enough to meet the qualifying standard. I left it there. I focused on the Asian Cross Country Championships, the national level selections for which were due a week or so before the 2016 SCMM. I was following that schedule. It was in this phase that the coach asked if I can be pacer for a distance of 25-30km at SCMM for Nitin (Nitendra Singh Rawat) and Kheta Ram. I reached Mumbai for that task following my cross country selections, where I had placed second. On race day at SCMM, I ran well without any problem for 30km. At 35km there was only Nitin and I left (at the front of the Indian elite group). Given I had executed what was expected of me I was told that if I wanted to, I can slow down. But I said I will continue and stop if I sensed anything going wrong. At about 38km Nitin pulled ahead. I stayed where I was, maintaining my pace because I had no experience at truly long distances; in my work-outs I hadn’t trained beyond 25km. At the same time, since I was past 38km, I was confident I will complete the race. I remember Nitin opened a gap of almost 200m. Eventually I finished the race. That was also when I noticed the time on the screen – 2 hours, 16 minutes. I was very happy that I had run within the qualifying time for the Olympics. What can I say? I was just happy. Can you tell us something about your background – where you grew up and how you became the athlete you are? I was born 1988 into an agricultural family, at Kalloor in Wayanad, Kerala. As a family we had no connection with sports. I am the only child of my parents. We now stay in Sulthan Bathery. My father is a farmer; years ago, he also worked as a wage-laborer but now he does his own farming. My mother is a housewife. I studied at the government high school in Kakkavayal. It was in eighth standard that I came into sports; that was the time I participated in the state level sports meet. I was interested in sports even earlier, I was interested in running but I didn’t have a proper environment for it. School was some distance from home. I therefore stayed at the school hostel. My physical education teacher – Vijayi – she encouraged my progression in sports. After eighth standard, I stayed at her house and finished my studies. Her house was close to the school and residing there helped me gain practice time for sports. Those days, the disciplines I participated in were 800m, 1500m and 5000m. My interest from then itself was to run long distance. It wasn’t because I wasn’t good at speed – I used to run the last leg in the 400m relay for my school team. I was interested more in long distance running. Was there any specific reason for liking distance running? That is hard to say. I liked sports and used to play whatever games were available including football. Sweating, panting – I was used to all that. Looking back, I think I had a decent capacity to handle panting. Maybe all that slowly built up endurance and made me good at distance running. Sportspersons from Kerala, often say that the state’s best distance runners come from hill districts like Idukki and Wayanad. The argument forwarded is that you grow up on a regimen of tackling uneven terrain, ascents and descents. Is that true of where you grew up and did such conditioning contribute to what you are? Where I grew up, such terrain was there but not in a pronounced fashion. For example, we also had fields, which were flat and big enough to play games. Following school, how did life pan out? After school, I joined Mar Athanasius College in Kothamangalam. I trained under P.I. Babu. Mar Athanasius College has a name in sports in Kerala. There was a reason why I joined that college. When I was in high school, completing my eleventh and twelfth, two teachers from this college had come inquiring if I would be keen to join Mar Athanasius College upon finishing school. Did they come looking for you at school because it is a college that seeks out talent in sports? Yes. Students from different schools, having track record in sports, have gravitated towards Mar Athanasius College. The management of that college took interest in sports. In school I had begun running the 10,000m and my time used to be around 33 minutes. Within one year of being at Mar Athanasius College, that lowered to 32 minutes. After two years attending my degree course, I was moving into the third year, when I got selected to the Indian Army. I then shifted to Hyderabad. How did you come to join the army? That is an interesting story. I was at home and 21 years old; to be precise the start of 21. Once you are fully past 21 years of age it becomes difficult to get entry into organizations like the army and railways. My friends Ajesh and Aneesh – they studied at the same college as I did – they wanted to go for trials being conducted for enlistment in the army. They asked me to go along. I wasn’t physically in best shape but I had my certificates, accumulated from sports events at university level, with me. As it turned out, I got selected to join the army but the other two didn’t make it. I joined the army in 2009 and underwent training for a year. In 2012 I moved to Army Sports Institute. In 2013, I secured a bronze medal at the national cross country championships. Since then I have been a podium finisher at the nationals in the 10,000m, either in cross country or on track. My marathon running commenced only in 2016 with that year’s edition of SCMM. I am now known as a marathon runner. In 2016 at the South Asian Federation (SAF) Games, I had run the 10,000m in 29:10. I could have done better but the last two kilometers proved to be problematic; my stomach was very tight. Had that not happened, I believe I could have taken that timing to below 29 minutes. The discipline I was originally interested in was the 10,000m. The marathon – I was interested in it but I never expected that I would be able to tackle it so quickly. It just happened. You said you are now known as a marathon runner. What do you see yourself as? I see myself as a long distance runner tackling distances beyond 1500m. Can you describe the Rio experience and your passage to Rio following the 2016 SCMM? After SCMM, I was battling a shin bone-injury. I was being treated in Delhi. The injury took time to heal. The training camp for the Olympics was in Bengaluru. I got three months to be there and prepare. Within that, in the first month there was interference from treatment protocols etc. I could devote two months to focused preparation. It was with that amount of training that I reached Rio. The Olympics was my first major international competition in the marathon. I wasn’t particularly tense. I knew I hadn’t had much training. The silver lining was that in training, the gap in performance between Nitin, Kheta and I wasn’t very big. The men’s marathon was on the last day of the Olympics. The women’s marathon had less than ideal weather. It was very warm; you would recall what happened to O.P. Jaisha. Luckily for the men, the night before their marathon and on the morning of the event, it rained. It was therefore not too hot. Sole problem was that the road was slippery in parts. For the first 25km, I managed to stay with the first batch. That was all I had the capacity to do. Eventually, I finished twenty fifth in the field. But then again, something tells me, that had I enjoyed more time to prepare, I may have finished within the top 20. What do you think you lacked? That is hard to say. I had worked out only so much. You therefore tend to conclude automatically that you worked out only so much and your performance corresponds to that. I have also had a continuing problem with my hamstring. It improves through treatment but then after strong competition, it gets tight again forcing me back to treatment. However on the whole, I was quite satisfied with the outcome at Rio. Now that you have run with international athletes what is your assessment of where Indians stand in the marathon and how we can improve? To tell you honestly, for the first 30km or so, we manage to stay in the first batch. What happens in the next 12 km, we can’t explain. In that distance, some block is occurring in the body. What this is due to, on account of what shortcoming this is happening – I don’t know. We don’t know how others are training. But there are videos available. We watch it and try to make relevant changes to how we train. The coaches do that. For example how I trained ahead of Rio is not how I train now. Many things have changed. The thing is – in the training phase, there is faith that we can live up to the targeted timing. What we are finding difficult is carrying that over into a competition scenario. My desire is to break the national record set in 1978 by Shivnath Singh. That is the goal. The first target however is performing well at the Asian Games. You ran the marathon at Rio in 2:15:25. The national record is 2:12. From a runner’s perspective how tough is the job of slicing away those few minutes? From a runner’s perspective, if you can cover every kilometer in three minutes eight seconds, you should be able to run a full marathon in 2:12. When we design our work-out we orient it towards this. However what we feel we can do while training is not quite what it is like in the thick of competition. For instance during work-out (training) I had the confidence that I will do 2:14. But that didn’t happen. There are also variables to consider like the weather on a given day. Conditions have to be hospitable. Not to mention, that challenge of sustaining the last 12 kilometers in good form. At the world championships, I could hang on to the first batch till around 27km. Thereafter they pull ahead while we remain at the same state or tend to fade. Thuriya, the sail boat in which Commander Abhilash Tomy KC will attempt his second solo nonstop circumnavigation as part of the upcoming 2018 Golden Globe Race (GGR), has become Europe-bound. She left Kochi for Rotterdam, aboard a ship, on Friday, March 30. The boat is scheduled to reach Rotterdam in Netherlands on April 26. From Rotterdam, the boat will be taken to Medemblik, a Dutch town famous for its sailing events. Here the Thuriya’s mast would be refitted and some final work on the boat as well as purchases relevant to the circumnavigation ahead would be done. 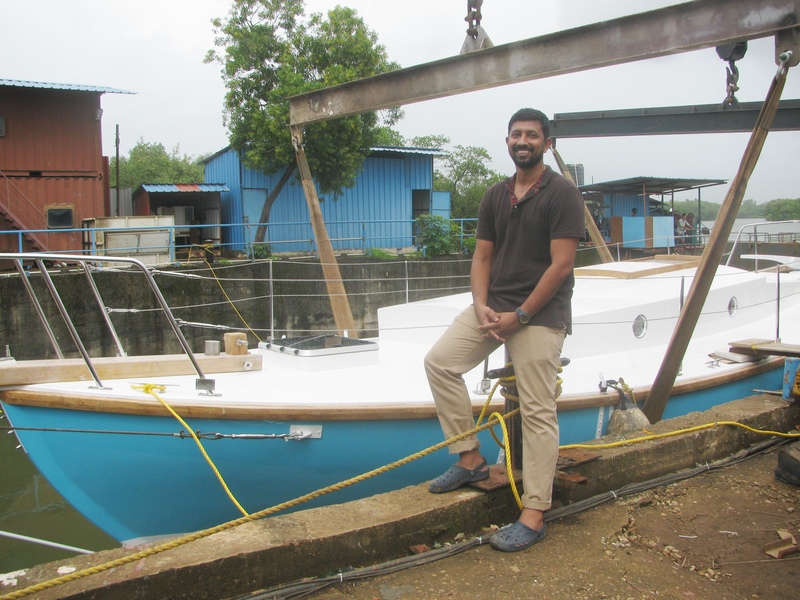 Abhilash will be in Netherlands by then along with either his team manager, Captain Dilip Donde (Retd) or Ratnakar Dandekar, owner of Aquarius Shipyard, which built the Thuriya. The plan is to depart Netherlands for UK on June 1. Abhilash has to report at Falmouth by June 11. Thereafter the team would move to France for pre-race inspection and training. GGR begins from Les Sables-d’Olonne on July 1, Abhilash said. Incidentally this seaside town in western France is also home to another famous race – the Vendee Globe yacht race, held once every four years. The Thuriya’s passage aboard a ship from Kochi is a slight departure from plans disclosed earlier. The process of registering her in India entailed paperwork that was more complex than anticipated. She was the first sail boat being registered under new rules framed by the Mercantile Maritime Department (MMD). When there is no precedent that can be easily followed paperwork takes time, Abhilash had said when contacted in the third week of March. 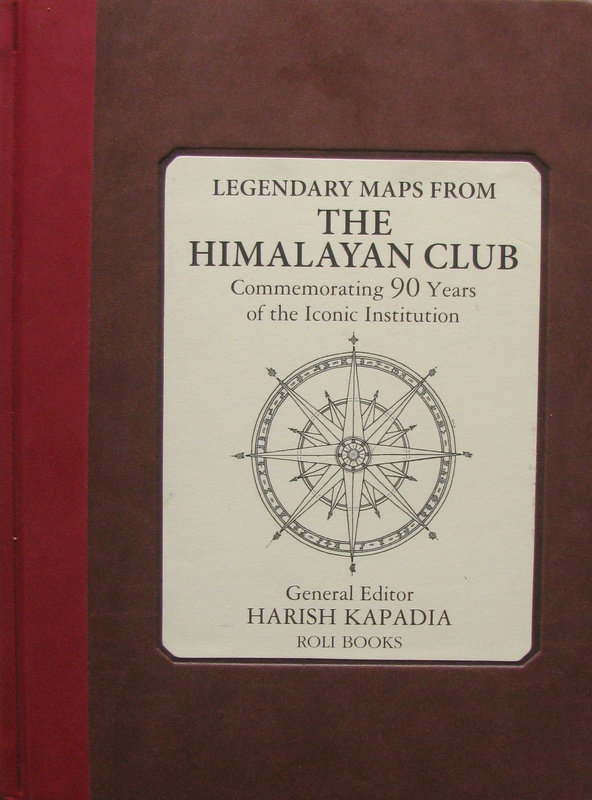 The Thuriya’s journey out from Goa – the pattern of it – also added to the paperwork needed. Had she sailed out to Europe on her own, procedures would have been simpler. But with boat and Abhilash required to report in UK by June 11, there wasn’t enough time to do a long voyage. She had to be shipped across; something that was anticipated months ago, except the distance got longer and the port of exit changed. 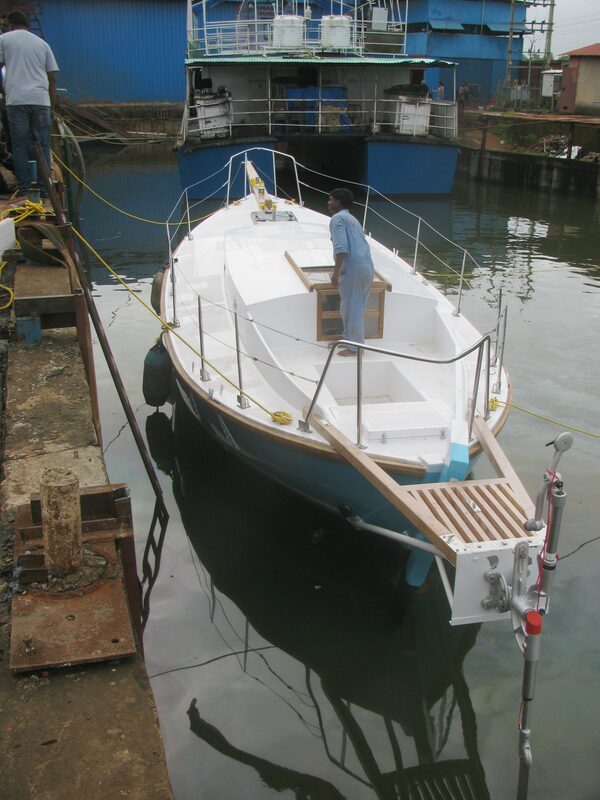 Early August 2017, when the Thuriya was floated at Aquarius Shipyard in Goa, expectation was that she would in due course – after her mast was fitted and sea trials were done – sail to Cape Town and be shipped from South Africa to the UK. That was subsequently altered to a ship-out from Kochi. According to Abhilash, any port on the Indian west coast would have sufficed but Kochi had a vessel scheduled to depart at apt time. Consequently the pattern of Thuriya’s journey out from Goa became one of first being trucked to Kochi and then, heading to Rotterdam in Netherlands aboard a ship. Such passage for a boat built in India, made the paperwork time consuming. There were suggestions to register the Thuriya overseas. That would have meant less time chasing documents. Abhilash did not want that. Given the boat was built in India, he felt it should be registered under the Indian flag. “ The boat is now registered in Mormugao,’’ he said on Saturday, March 30. Mormugao is home to Goa’s main port. The Thuriya had her mast fitted in December 2017. From then till almost mid-March 2018, she underwent sea trials locally, Abhilash said. One limitation in these trials was that strong winds were missing. Abhilash had to make do with the weather conditions available. Trials done, the little boat had her mast removed for the journey by truck from Goa to Kochi and onward shipment to Rotterdam.